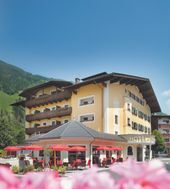 Welcome to Hotel Bräu ****Tradition and Zillertal hospitality! 4-star Hotel-Gasthof Bräu has been around since around the year 1500 and has a long and genuine Tyrolean history. Over the centures Bräu has adapted to the requirements of the times. It is our aim to remain historically authentic. At Bräu we have collected a number of treasures over the years which have been passed down from generation to generation. Today, Hotel Bräu is a real jewel on the Zell market square, the geographic and cultural centre of the Zillertal Valley. Your hosts, the Kolbitsch family, will make sure that you enjoy your stay in a welcoming and friendly environment which reflects the traditional and genuine hospitality you can expect in the region! This hotel is open all year round.